ROWE RACING displayed a marked improvement in form, 34 days before the start of the 45th ADAC Zurich 24h race at the Nürburgring. 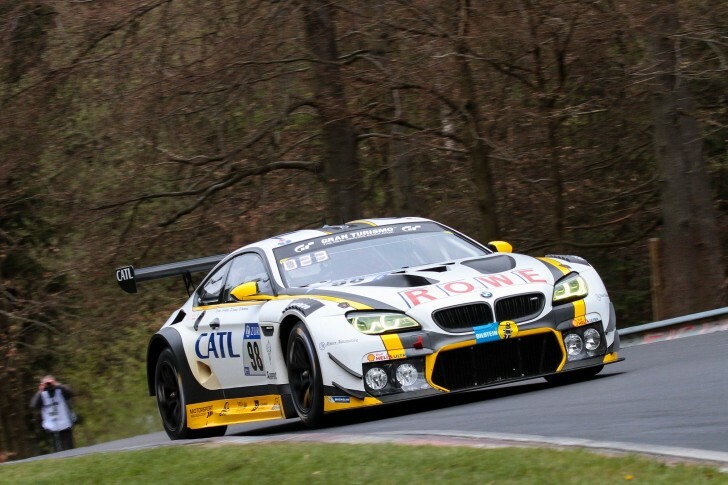 One of the BMW M6 GT3s competing for the team from St. Ingbert on Sunday claimed sixth place in the 24-hour qualification race, while the second car clawed back 14 positions in the dress rehearsal event, only missing out on the top 10 by one place. ROWE RACING was the best-placed BMW team, five weeks before the highlight of the season takes place in the Eifel mountains on 27th/28th May. Current BMW DTM driver Maxime Martin from Belgium, who shared the cockpit of the #99 BMW M6 GT3 with BMW works drivers Philipp Eng from Austria, Britain’s Alexander Sims and the team’s new German Nordschleife specialist Marc Basseng, battled a Mercedes for fifth place as the race drew to a close, attempting to secure early confirmation of a place in top 30 qualifying for the 24h race. Martin had started the race from 14th place and was faster than his opposite number, but had no chance to overtake on the last lap on the long straights from Döttinger Höhe down to the finish line. He missed out by just 1.027 seconds. British driver Sims, who competed in both cars, started the chase in the #98 car from even further back. Starting from 25th place, he took the M6 up to 17th before the first change of drivers. Together with Dutch driver Nick Catsburg, Finland’s Markus Palttala and his compatriot Richard Westbrook, Sims was able to further improve, reaching eleventh place as the race progressed. The team is still searching for some top speed improvement before the 24h race, without losing the strengths of the BMW M6 GT3 in the numerous fast corners on the 25.378-kilometre long combination of Grand Prix circuit and Nordschleife. However, this will be no easy task with the current “balance of performance”. Nonetheless, those in charge of ROWE RACING were very pleased with the reliability of the cars and the faultless work of the drivers and the team at the dress rehearsal.